and only you can make 'em real." South Carolina native Edwin McCain achieved a modicum of musical success in 1997 with the hummable single I'll Be. Falling under the protective wing of the then hot Hootie and The Blowfish as an opening act on their summer tour that year helped the singer/songwriter expose his music to larger audience. McCain hasn't had much in the way of chart action since then, and this release from ATC is a low-key look at his career, presented as sort of a video scrapbook. 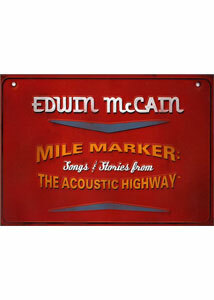 Mile Marker: Songs & Stories from the Acoustic Highway is a mish-mosh of material, mostly centered on featuring snippets of McCain chatting, broken up with occasional musical segments. The disc is divided into a number of well-defined sections (Video Vault, Live Music and Storyteller) and presents the singer in an easy, likeable light. The guy comes across as pretty down to earth, and he even tells a couple of genuinely self-effacing stories, including a humbling and funny one about his band's perceived star power after their tour with Hootie and The Blowfish. Prior to watching this, I was casually familiar with McCain from the I'll Be single, and hadn't really given him much thought since that song disappeared from radio. In fact, I wasn't even really a fan of the song itself. The Live Music segment here features three acoustic numbers from McCain (including a stripped down I'll Be) that made me wish that ATC had actually filled Mile Marker with his concert footage, rather than just the three songs, and forsaken the interview segments completely. Simply put, McCain's live stuff is wonderfully done, and he even conveys a fun between-song banter with the crowd, and offers up a nice poke at one-hit wonders with Radio Star. Most of Mile Marker is akin to a press kit or la prolonged video magazine article. ATC should have included more live music, and less chitchat, and this release would have been one quality music DVD, rather than the mixed bag that only left me wanting more. Image Transfer Review: The video content is a mixture of interviews, concert and music video footage, presented here primarily in full frame at 1.33:1. Image quality varies slightly across the different sources, but colors by and large are bright, especially during the acoustic concert footage. No noticeable print flaws were evident on this transfer. Audio Transfer Review: The bulk of this disc is presented in 2.0 surround, and the mix is crisp and well balanced. Where Mile Marker really excels, however, is the brief acoustic concert segment in the Live Music section, where McCain performs three songs with an optional 5.1 Dolby Digital track. The 5.1 is outstanding, and made me wish that this release had simply been an hour of McCain performing, rather than the hodge-podge of material that it is. Rear channels accent the crowd sounds and give McCain's performance a fullness that sounds incredibly deep and natural. Though it is only present for about 15 minutes of Mile Marker's entire runtime, the 5.1 track is impressive, and easily the audio highpoint of this disc. Extras Review: It's hard to tell where the main content of this disc ends and the extras begin, so as far as I'm concerned the only "extras" are the obligatory discography and weblinks. The other components of this release seem loosely connected as part of the overall narrative, including the slide show/photo gallery section, which would normally be considered a supplement. The disc is cut into 24 chapters, and does not feature any subtitles or closed-captioning. I suppose as an introduction (or re-introduction, perhaps) to Edwin McCain, this release from ATC does its job. Unfortunately, the comparatively short concert moments are the high points (especially with a terrific 5.1 mix), and I could only scratch my head and wonder why ATC didn't include more.